ABS and PLA probably the easiest material to work with when you're first starting out with 3D printing. 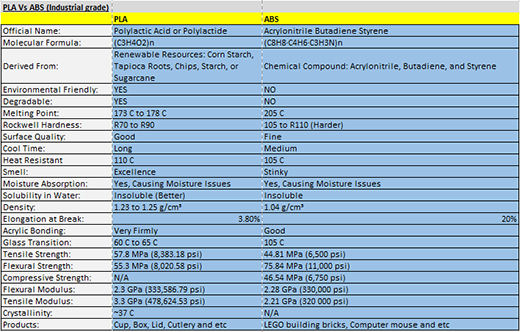 ABS and PLA are thermoplastic materials that has been derived from renewable resources like corn starch and sugar cane. PLA is environmentally friendly and very safe to work with materials for 3D printing. PLA also has a very sharp glass transition point so if you use a fan to cool it, it will set into a solid very quickly. PLA can achieve a greater range of geometries than are possible with other plastics. It also reduces the thermal stress on the printed parts. PLA does not require any curing or post-production treatment. PLA can be sanded and coated with automotive spray filled and can also be painted over with acrylic paint.